The heart is a muscular organ about the size of your clenched fist that works non-stop from when it is first developed till the day you die. It is the organ that pumps blood around the body. The right side of the heart receives blood that has very little oxygen and sends it to the lungs, where the oxygen is added to the blood. The left side of the heart then receives that oxygen-rich blood and pumps it to the entire body. The heart is divided into four chambers, two upper atria, and two lower ventricles. Apart from the four chambers, the human heart also has valves. Read on to know more. First things first, there are four valves which control the flow of blood through the heart. They are namely, the aortic valve, the mitral valve, the pulmonic valve and the tricuspid valve. Heart valves are composed of strong, thin pieces of tissues called leaflets and are attached to the annulus, a tough fibrous band of tissue. The annulus keeps the valve leaflets supported and helps maintain their shape. The tricuspid valve is the first valve through which blood flows during one heartbeat. It is one of the two atrioventricular valves and is located between the right atrium and the right ventricle. This valve consists of three leaflets (flaps), that work together to keep blood flowing into the ventricle, preventing the backflow of the right ventricle’s blood back into the right atrium. This is the second valve that blood flows through in the heart. It is also called a semilunar valve due to its shape. It sits between the right ventricle and pulmonary artery that goes to the lungs, and opens when the right ventricle contracts, allowing blood to enter the lungs. This is the third valve in the heart and the second of the two atrioventricular valves. It is located on the left side of the heart and is also referred to as the bicuspid valve. The mitral valve consists of two flaps or leaflets that open to allow oxygen-rich blood to flow into the left ventricle. It prevents blood from going from the left ventricle back into the left atrium by opening only when the left atrium contracts. 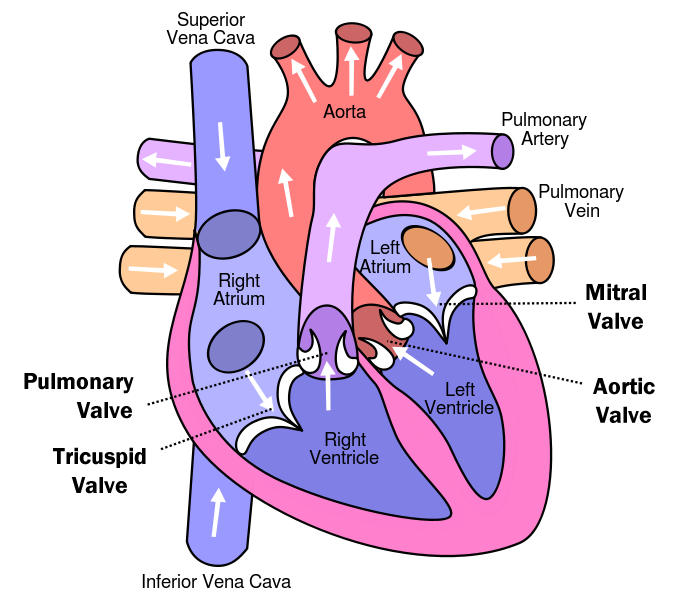 This is the last valve in the heart and is present between the left ventricle and the aorta. This valve too is referred to as a semilunar valve, along with the pulmonic valve. It is composed of three leaflets or flaps and functions by preventing blood from entering the aorta too early. It opens when the left ventricle contracts and lets the blood go outside the heart and around the body. What Disease Can Affect Your Heart Valves? This is a condition where the heart valve is not able to close properly and allows blood to regurgitate (or flow backwards) across the valve. This means that the valve "leaks" some blood backwards, causing the heart to pump harder to send blood to other parts of the body. The condition is known as mitral regurgitation, pulmonic regurgitation, aortic regurgitation or tricuspid regurgitation, depending on which valve is affected. This is a condition where the valve openings are abnormally small, causing the heart to work harder while pumping blood through them. This can cause fatigue in the heart, leading to heart failure and cardiac arrest. This condition can affect all four valves, rendering them stenotic (restrictive of blood flow). The conditions are called mitral stenosis, pulmonic stenosis, tricuspid stenosis and aortic stenosis, depending on which valve is affected. These are diseases present in a person before birth. These mostly affect the pulmonic or aortic valves and might cause the leaflets to be absent, of an incorrect size or not connected properly with the annulus. One example is the bicuspid aortic valve disease, which causes the aortic valve to have only two leaflets instead of three. This means that the valve either becomes leaky or unable to let blood flow normally (stiff). These are diseases or changes in the heart valves that once functioned normally. They might be caused by trauma, infection or any kind of disease affecting the heart. Mitral valve prolapse is one such condition where the leaflets of the mitral valve become abnormal and enter the left atrium again when the heart contracts. This causes the valve to leak, but it requires no treatment. There are many other causes as to why a valve might become defective. It might be due to the annulus becoming too wide, or a heart muscle tearing. The valve leaflets also might become stiff and unable to function properly. Other causes might include diseases of the coronary artery, syphilis, hypertension or aortic aneurysms. How Are Valve Disorders Treated? After knowing "How many valves are in the heart?" functions and malfunctions of heart valves, you should know that treatments for valve diseases vary depending on the severity and occurrence of symptoms. Vasodilators to dilate blood vessels. Valvuloplasty is another procedure that may be used to treat stenosis. During the procedure, a doctor inserts a small balloon into a valve and inflates it to widen the opening. The balloon is then removed.